Tomorrow: Penulitmate stage, Porto S.Elpidio-Porto S.Elpidio, 209 km with 18 short climbs totaling 3100 meters of elevation gain. The finish is suited to riders like Sagan, Moser, Pozzato, and Cancellara. 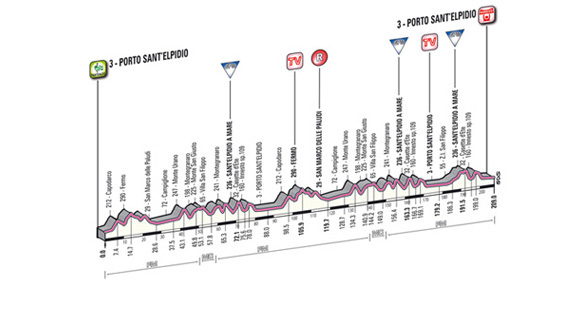 The race will conclude the following day with a short individaul tme trail of 9.2 km in San Benedetto del Tronto on the Adriatic coast.